Large amounts of plasticizers are processed to make brittle plastics, elastomers, paints and varnishes, as well as adhesives smooth, flexible or even useful in the first place. 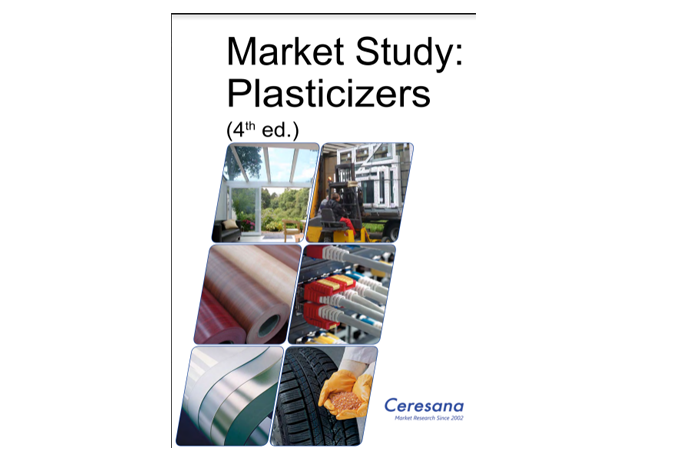 The latest, already fourth, plasticizer report by the market research company Ceresana forecasts the demand for this controversial but so far indispensable material to increase to about 9.75 billion tonnes worldwide until 2024. Since phthalates are considered as harmful to health and environment and were already banned from many applications, processors of plasticizers are increasingly looking for phthalate-free alternatives. However, DEHP (bis(2-ethylhexyl)phthalate) was still the most frequently used plasticizer type in 2016 with 3.07 million tonnes. About one third of the plasticizer market was accounted for by the phthalates DINP (diisononyl phthalate) and DIDP (diisodecyl phthalate). DEHP, however, will register below-average growth rates and will presumably continue to lose market shares. In contrast to that, the analysts of Ceresana expect an increasing demand volume for DINP/DIDP and non-phthalates, which will develop at growth rates of 3.6% and 3.2% p.a. respectively. The most important application area are plastic products – about 87% of all plasticizers were used for this sector in 2016. Plasticizers are utilized for PVC in particular. 2.14 million tonnes were used for films alone, followed closely by cables and profiles. Demand for plasticizers in the production of rubber products, paints and varnishes as well as adhesives is considerably lower. Until 2024, Ceresana expects the highest increases in plasticizer demand for cables and cable sheathing. The plasticizer industry in Asia-Pacific accounted for about 59% of global demand in 2016. Due to above-average growth rates, demand in this region will presumably rise to about 6 million tonnes in the years to come. Behind Asia, Western Europe ranked second in 2016 with 12.1%, followed by North America with 11.5%. Chapter 1 provides a presentation and analysis of the global plasticizer market – including forecasts up to 2024: Demand and revenues will be examined for each region of the world. The plasticizer types DEHP, DINP, and DIDP, other phthalates, and non-phthalates are included. Chapter 2 offers demand and revenue data for 45 countries in total. Additionally, demand is split by the applications profiles, films, cables, floorings, other plastics, elastomers, paints & varnishes, and adhesives for the individual countries. Chapter 3 offers a well-founded analysis of the application areas of plasticizers: Data on demand development, split by the seven world regions Western Europe, Eastern Europe, North America, South America, Asia-Pacific, the Middle East, and Africa are given. Chapter 4 provides useful profiles of the largest manufacturers of plasticizers – clearly arranged according to contact details, turnover, profit, product range, production sites, and profile summary. In-depth profiles of 79 producers are given, including Adeka Corporation, Arkema S.A., BASF SE, Clariant International Ltd., Croda International Plc., Dow Chemical Company, Eastman Chemical Company, Jungbunzlauer AG, Koninklijke DSM N.V., Lanxess AG, Mexichem, S.A.B. de C.V., PolyOne Corporation, Roquette, and Songwon Industrial Co., Ltd.